← Will the World Economy Continue to “Roll Along” in 2018? Since the late 1990s, globalization has seemed to be the great hope for the future. Now this great hope seems to be dimming. Globalization sets up conflict in the area of jobs. Countries around the world compete for development and jobs. If there is not enough cheap-to-produce energy to go around, huge wage disparity is likely to result. We know from physics and history that economies need to grow, or they collapse. The wage disparity that high-wage countries have been experiencing in recent years is evidence that the world economy is already reaching energy limits. There are no longer enough jobs that pay well to go around. Any drop in energy supply is likely to worsen the job situation. Most observers miss this problem, because they expect high oil prices to signal energy limits. This time, the signal is low wages for a significant group of workers, rather than high oil prices. This situation is possible in a networked economy, but it is not what most people look for. Unhappy citizens can be expected to react to the wage disparity problem by electing leaders who favor limits to globalization. This can only play out in terms of reduced globalization. History and physics suggest that economies without adequate energy supply can be expected to collapse. We have several recent examples of partial collapses, including the Great Depression of the 1930s and the collapse of the Soviet Union. Such collapses, or even more extensive collapses, might occur again if we cannot find energy alternatives that can be quickly scaled up to replace oil and coal in the very near term. These replacements need to be cheap-to-produce, non-polluting, and available in huge quantities. The story that the economy doesn’t really need a growing supply of very cheap-to-produce energy is simply a myth. Let’s look at some of the pieces of this story. The world economy needs to grow or it collapses. Once all of the nations of the world are included in the world economy, one obvious source of growth (incorporating nations that are not yet industrialized into the world economy) disappears. The reason why the world economy needs to grow is because the economy is a self-organized system that operates under the laws of physics. In many ways it is like a two-wheeled bicycle. A bicycle needs to roll quickly enough, or it will fall over. An economy must grow quickly enough, or debt cannot be repaid with interest. Also, government promises may be a problem with slow growth. Pensions for the elderly are typically paid out of tax revenue collected in that same year. It is easy for a mismatch to take place if the number of younger workers is shrinking or if their wages are lagging behind. Figure 1. 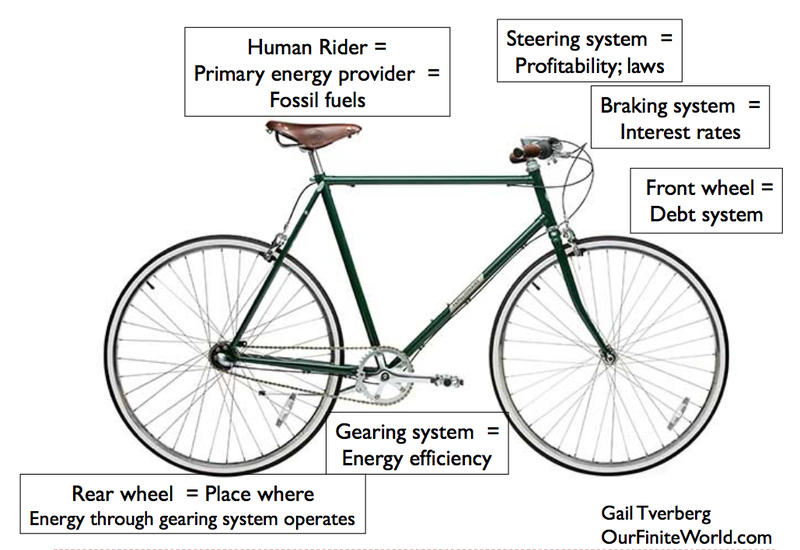 Author’s view of analogies of speeding upright bicycle to speeding economy. I explain a little more about my bicycle analogy in Will the World Economy Continue to “Roll Along” in 2018? Economies throughout the ages have collapsed. In some cases, entire civilizations have disappeared. In the past 100 years, partial collapses have included the Great Depression of the 1930s, the collapse of the central government of the Soviet Union in 1991, and the Great Recession of 2008-2009. Economic collapses are analogous to bicycles falling over. 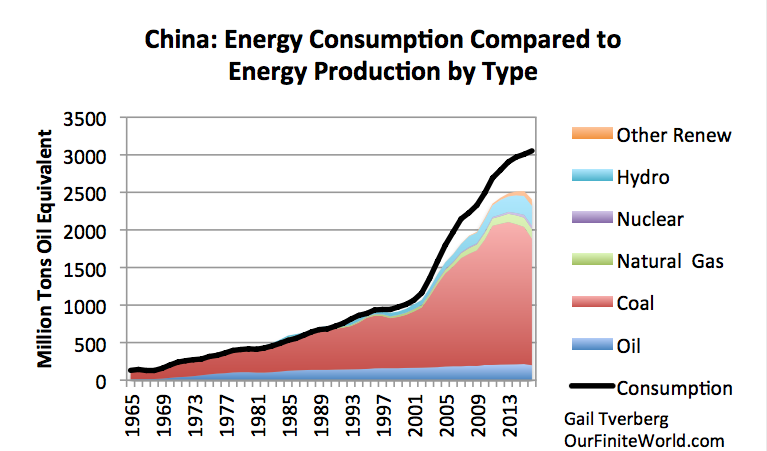 A growing supply of energy products is extraordinarily important for keeping the world economy operating. We can see in Figure 1 that the energy of the person operating a bicycle is very important in allowing the operation of the bicycle to continue. In the world’s economy, the situation is similar, except that we are facing a problem of a world population that is continually growing. In a sense, the economic situation is more like a rapidly growing army of bicycles with riders. Each member of the economy needs goods and services such as food, homes, clothing, and transportation. The members of the economy can collapse individually (for example, growing suicide rate) or in much larger groups (collapsing government of a country). Figure 2. 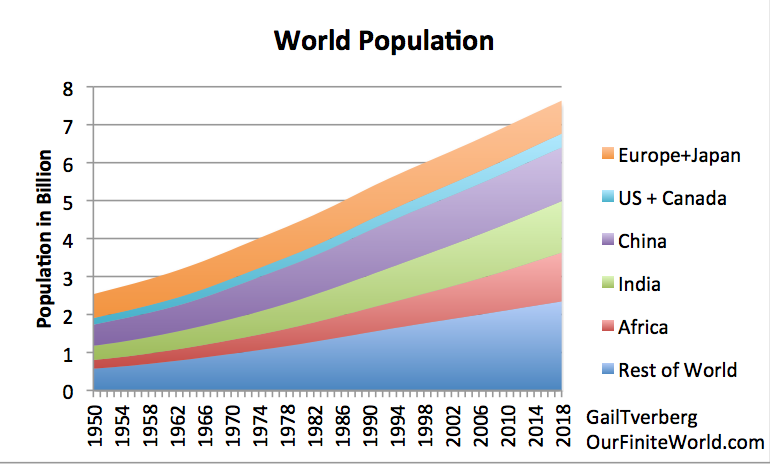 World population according to the United Nations 2017 historical estimates and Medium forecast of population growth after 2017. In an economy, we have a choice regarding how much energy to use. If more energy is used, workers can have many tools (such as trucks and computers) to leverage their productivity. If all goods are made with few energy inputs other than human labor, most workers find themselves working in subsistence agriculture. The total amount of goods and services produced in such an economy tends to be very small. If supplemental energy is used, many more jobs that pay well can be added, and many more goods and services can be created. Workers will be rich enough that they can pay taxes to support representative government that supports many services. The whole economy will look more like that of a rich nation, rather than the economy of Somalia or Haiti. Individual nations can grow their economies by using available energy supply to create jobs that pay well. Globalization sets up competition for available jobs. If a given country has a lot of high paying jobs, this is likely to be reflected in high per capita energy consumption for that country. There are two reasons for this phenomenon: (1) it takes energy for an employer to create jobs, and (2) workers can use their wealth to buy goods and services. This wealth buys more goods and services made with energy products. One measure of how well the world economy is doing is world energy consumption per capita. On this basis, the world economy is already reaching limits. Figure 3. World energy per capita and world oil price in 2016 US$. Energy amounts from BP Statistical Review of World Energy, 2017. Population estimates from UN 2017 Population data and Medium Estimates. It is clear from Figure 3 that energy consumption tends to move in the same direction as oil price. If “demand” (which is related to wages) is high, both oil price and the amount of energy products sold will tend to be high. If demand is low, both oil price and the amount of energy products sold will tend to be low. Since 2014, energy consumption has remained quite high, but oil prices have fallen very low. Today’s oil prices (even at $70 per barrel) are too low for oil producers to make adequate investment in the development of new fields and make other needed expenditures. If this situation does not change, the only direction that production of oil can go is down, rather than up. Prices may temporarily spike, prior to the time production falls. Looking at energy consumption per capita on Figure 3 (above), we notice that this amount has been fairly flat since 2011. 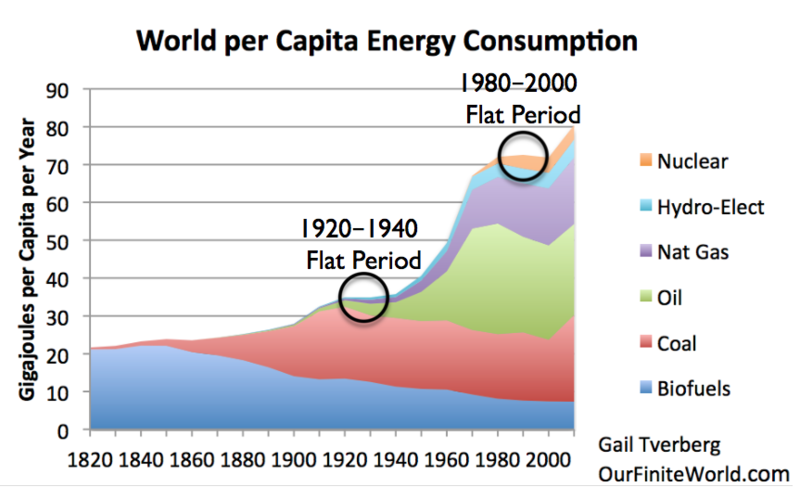 Normally, in a growing world economy, a person would expect energy consumption per capita to rise, as it has most of the time since 1820 (Figure 4). Figure 4. World Energy Consumption by Source, based on Vaclav Smil estimates from Energy Transitions: History, Requirements and Prospects (Appendix) together with BP Statistical Data for 1965 and subsequent, divided by population estimates by Angus Maddison. 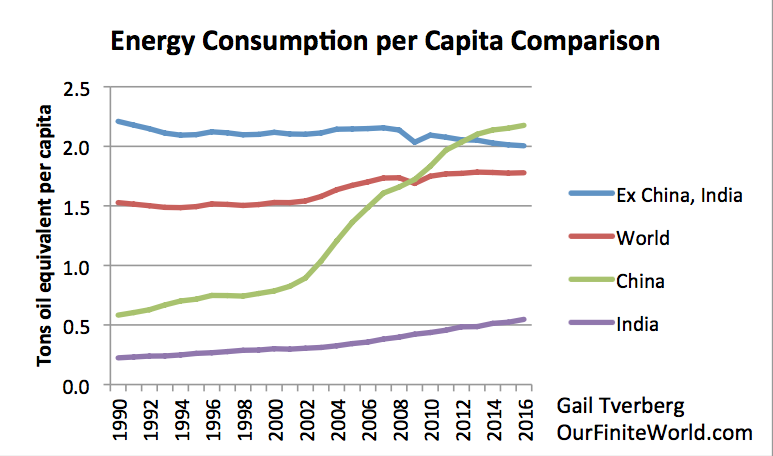 The fact that energy consumption per capita has been nearly flat since 2011 is worrying. It is a sign that the world economy may not be growing very rapidly, regardless of what government organizations are reporting to the World Bank. Some subsidized growth should not really be considered economic growth. For example, some Chinese cities have been buying off the country’s housing glut with borrowed money. A better accounting would likely show lower GDP growth for China and the world. Looking more closely at Figure 3, we note that energy per capita hit a high point in 2013, just before world oil prices began sliding downward. Since then, world energy consumption per capita has been trending downward. This is part of the reason for gluts in supply. Producers had been planning as if normal growth in energy consumption would continue. In fact, something is seriously wrong with demand, so world energy consumption has not been rising as fast as in the past. The point that is easy to miss is that (a) growing wage disparity plus oil gluts and (b) high oil prices are, in a sense, different ways of reflecting a similar problem, that of an inadequate supply of truly inexpensive-to-produce oil. High-cost-to-produce oil is not acceptable to the economy, because it doesn’t produce enough jobs that pay well, for each barrel produced. If oil prices today truly represented what oil producers (such as Saudi Arabia) need to maintain their production, including adequate tax revenue and funds to develop additional production, oil prices would be well over $100 per barrel. We are dealing with a situation where no oil price works. Either prices are too high for a large number of consumers or they are too low for a large number of producers. When prices are low, relative to the cost of production, we tend to get wage disparity and gluts. The reason why energy demand is not growing is related to increased wage disparity. This is a problem for globalization, because globalization acts to increase wage disparity. In the last section, I mentioned that demand is closely connected to wages. It is really wage disparity that becomes a problem. Goods and services become less affordable for the people most affected by wage disparity: the lower-paid workers. These people cut back on their purchases of goods such as homes and cars. Because there are so many lower-paid workers in the world, demand for energy products, such as oil and coal, fails to grow as rapidly as it otherwise would. This tends to depress prices for these commodities. It doesn’t necessarily reduce production immediately, however, because of the long-term nature of investments and because of the dependence of oil exporters on the revenue from oil. 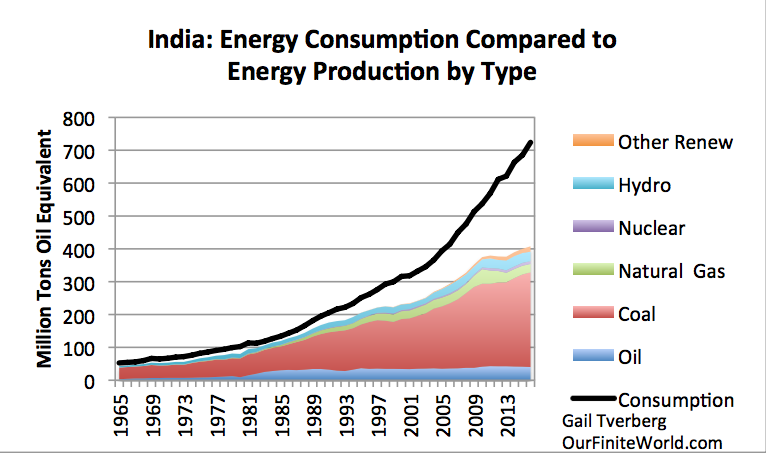 Figure 5 shows that China and India’s energy consumption per capita has been rising, leaving less for everyone else. Figure 5. Energy consumption per capita comparison, based on energy data from BP Statistical Review of World Energy 2017, and UN 2017 Population Estimates. A major way that an economy (through the laws of physics) deals with “not enough goods and services to go around” is increased wage disparity. To some extent, this occurs because newly globalized countries can produce manufactured products more cheaply. Reasons for their advantage are varied, but include lower wages and less concern about pollution. As a result, some jobs that previously would have been added in developed countries are replaced by jobs in newly globalized countries. It is probably not a coincidence that US labor force participation rates started falling about the time that China joined the World Trade Organization in 2001. Figure 6. US Labor Force Participation Rate, as prepared by Federal Reserve Bank of St. Louis. Lower wages for unskilled workers may also occur as the result of immigration, and the resulting greater competition for less skilled jobs. This has been a particular concern in the UK. Adding China, India, and other countries through globalization temporarily gives a boost to world energy production. This boost disappears as the energy resources of the newly added countries deplete. Both China and India are primarily coal producers. They rapidly ramped up production since joining the World Trade Organization (in 1995 for India; in 2001 for China). Now China’s coal production is shrinking, falling 11% from 2013 to 2016. Both China and India are major importers of fossil fuels (difference between black line and their own production). Figure 7. China’s total energy consumption compared to its energy production by type, based on BP Statistical Review of World Energy, 2017. Figure 8. India’s total energy consumption compared to its energy production by type, based on BP Statistical Review of World Energy, 2017. 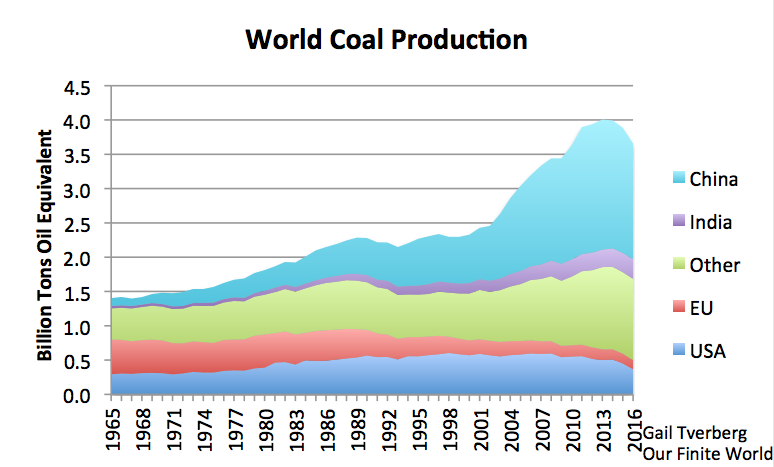 China and India’s big surge in coal production has had a major impact on world coal production. The fact that both countries have needed substantial imports has also added to the growth in coal production in the “Other” category in Figure 9. Figure 9 also shows that with China’s coal production down since 2013, total world coal production is falling. Figure 9. World coal production by part of the world, based on BP Statistical Review of World Energy, 2017. Figure 10 shows that world GDP and world energy supply tend to rise and fall together. In fact, energy growth tends to precede GDP growth, strongly suggesting that energy growth is a cause of GDP growth. Figure 10. 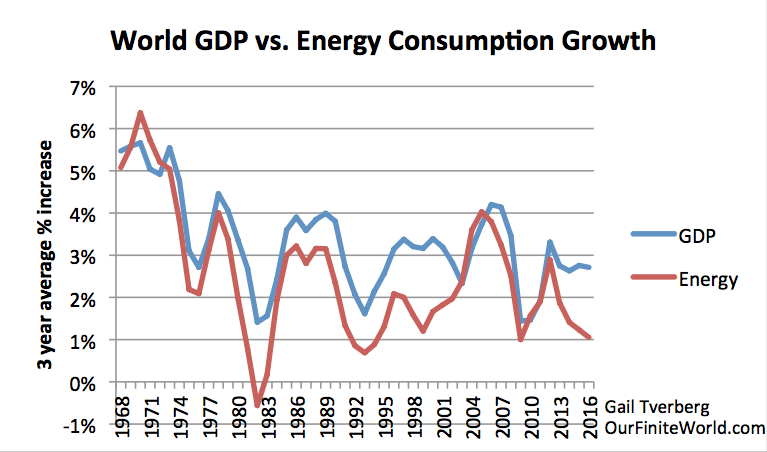 World three-year average GDP growth compared to world three-year average energy consumption growth. GDP data is from the World Bank, based on 2010 US$ weights of GDP by country; energy consumption is from BP Statistical Review of World Energy, 2017. If a growth in energy consumption is indeed a primary cause of world economic growth, the drop in world coal production shown in Figure 9 is worrying. Coal makes up a large share of world energy supply (28.1% according to Figure 12). If its supply shrinks, it seems likely to cause a decline in world GDP. 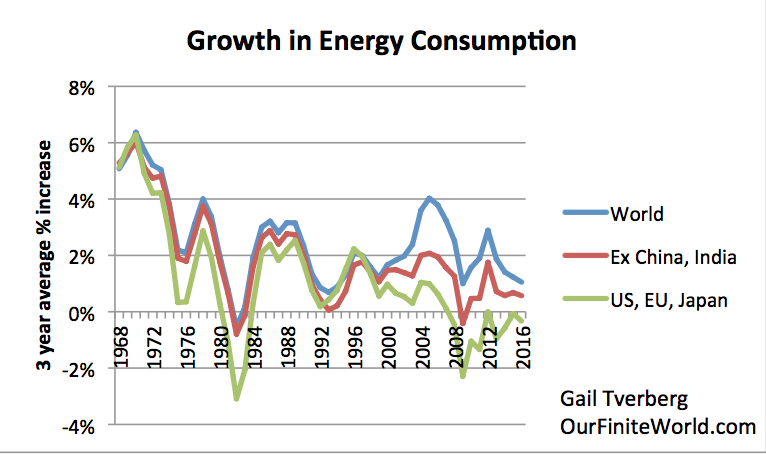 Figure 11 shows energy consumption growth on a basis comparable to the energy consumption growth shown on Figure 10, except for different groupings: for the world in total, the world excluding China, and for the combination of the US, EU, and Japan. We can see from Figure 11 that the addition of China and Japan has greatly propped up growth in world energy consumption since 2001, when China joined the World Trade Organization. Figure 11. Three-year average growth in energy consumption, for the world total; the world less China and India; and for the sum of the United States, the European Union, and Japan. 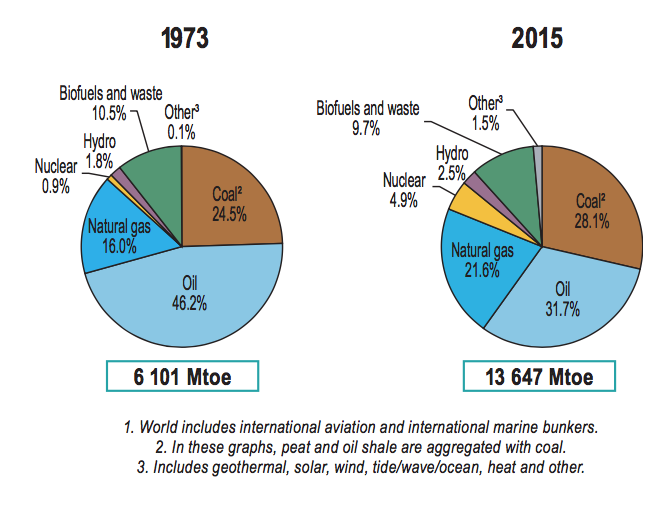 Energy data from BP Statistical Review of World Energy, 2017. The amount of the “benefit” was greatest in the 2003-2007 period. If we look at Exhibit 10, we see that world economic growth was around 4% per year during that period. This was a recent record high. Now the benefit is rapidly disappearing, reducing the possibility that the world energy consumption can grow as rapidly as in the past. If we want world energy consumption per capita to rise again, we need a new large rapidly growing source of cheap energy to replace the benefit we received from China and India’s rapidly growing coal extraction. We don’t have any candidates for a suitable replacement. Intermittent renewables (wind and solar) are not candidates at all. According to the IEA, they comprised only 1% of world energy supply in 2015, despite huge investment. They are part of the gray “Other” slice in Figure 11. Academic studies regarding wind and solar have tended to focus on what they “might” do, without considering the cost of grid integration. They have also overlooked the fact that any energy solution, to be a true energy solution, needs to be a huge energy solution. It has been more pleasant to give people the impression that they can somehow operate a huge number of electric cars on a small amount of subsidized intermittent electricity. 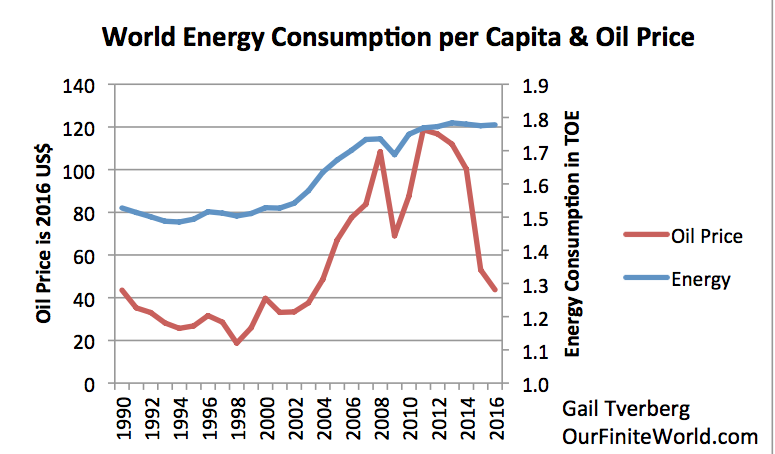 On a world basis, energy consumption per capita seems to need to be rising to maintain a healthy economy. When energy consumption is growing on a per capita basis, the situation is similar to one in which the average worker has more and more “tools” (such as trucks) available at his/her disposal, and sufficient fuel to operate these tools. It is easy to imagine how such a pattern of growing energy consumption per capita might lead to greater productivity and therefore economic growth. If we look at historical periods when energy consumption has been approximately flat, we see a world economy with major problems. Figure 13. World per Capita Energy Consumption with two circles relating to flat consumption. World Energy Consumption by Source, based on Vaclav Smil estimates from Energy Transitions: History, Requirements and Prospects (Appendix) together with BP Statistical Data for 1965 and subsequent, divided by population estimates by Angus Maddison. The flat period of 1920-1940 seems to have been caused by limits reached on coal production, particularly in the United Kingdom, but also elsewhere. World War I , the Great Depression of the 1930s, and World War II all took place around this time period. Charles Hall and Kent Klitgaard in Energy and the Wealth of Nations argue that resource shortages are frequently the underlying cause for wars, including World Wars I and II. The Great Depression seems to have been a partial economic collapse, indirectly related to great wage disparity at that time. Farmers, in particular, had a difficult time earning adequate wages. The major event that took place in the 1990 to 2000 period was the collapse of the Soviet Union in 1991. The central government collapsed, leaving the individual republics to operate independently. The Soviet Union also had strong trade relationships with a number of “satellite” countries, including Cuba, North Korea, and several Eastern European countries. In the next section, we will see that this collapse had a serious long-term impact on both the republics making up the Soviet Union and the satellite countries operating more independently. The example of the Soviet Union shows that collapses can and do happen in the real world. The effects can be long lasting, and can affect trade partners as well as republics making up the original organization. In Figure 14, the flat period of the 1980-2000 period seems to be related to intentional efforts of the United States, Europe, and other developed countries to conserve oil, after the oil price spikes of the 1970s. For example, smaller, more fuel conserving vehicles were produced, and oil-based electricity generation was converted to other types of generation. Unfortunately, there was still a “backfire” effect related to the intentional cutback in oil consumption. Oil prices fell very low, for an extended period. The Soviet Union was an oil exporter. The government of the Soviet Union collapsed in 1991, indirectly because with these low oil prices, the government could not support adequate new investment in oil and gas extraction. Businesses closed; people lost their jobs. None of the countries shown on the Figures 14 and 15 have as high energy consumption per capita in 2016 as they did back when the Soviet Union collapsed. Figure 14. 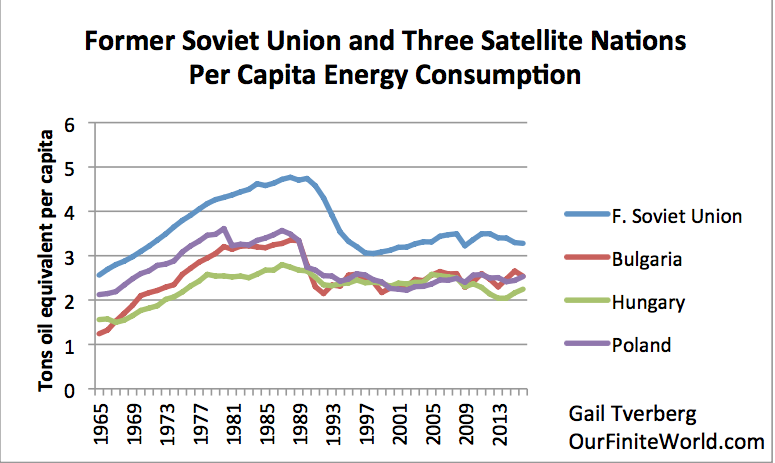 Per capita energy consumption for the Soviet Union and three of its satellite countries. Energy data from BP Statistical Review of World Energy, 2017. Population data from UN 2017 Population data and Middle Estimates. The three satellite countries shown on Figure 14 (Bulgaria, Hungary, and Poland) seem to be almost as much affected as the republics that had been part of the Soviet Union (Figure 15). This suggests that loss of established trading patterns was very important in this collapse. Figure 15. 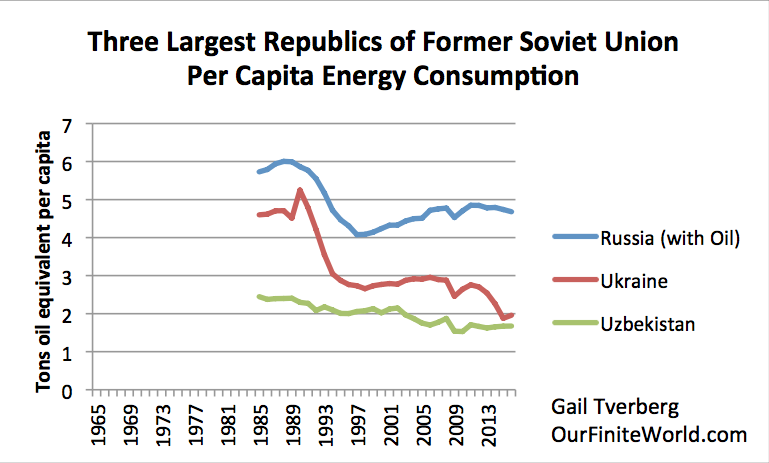 Per capita energy consumption for the three largest (by population) republics that made up the Soviet Union. Energy data from BP Statistical Review of World Energy, 2017. Population data from UN 2017 Population data and Middle Estimates. Russia’s per capita energy consumption dropped 29% between peak and trough. It had significant fossil fuel resources, so when prices rose again, it was again able to invest in new oil fields. Ukraine was a major industrial center. It was significantly impacted by the loss of oil and gas imports. It has never recovered. The country that seemed to fare best was Uzbekistan. It had little industry before the collapse, so was less dependent on energy imports than most. Of all of the countries shown on Figures 14 and 15, Uzbekistan is the only one that did not lose population. Today, there seem to be many countries that are not far from collapse. Some of these countries are energy exporters; some are energy importers. Many of us have read about the problems that Venezuela has been having recently. Ironically, Venezuela has the largest oil reserves in the world. Its problem is that at today’s prices, it cannot afford to develop those reserves. The Wikipedia article linked above is labeled 2014-2018 Venezuelan protests. Oil prices dropped to a level much lower than they had been in 2014. It should not be surprising that civil unrest and protests came at the same time. Figure 16. 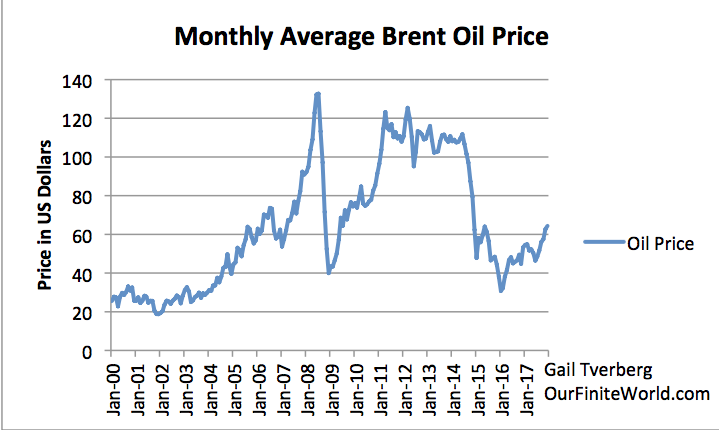 Monthly average spot Brent oil prices, through December 2017, based on EIA data. Other oil producers are struggling as well. Saudi Arabia has recently changed leaders, and it is in the process of trying to sell part of its oil company, Saudi Aramco, to investors. The new leader, Mohamed bin Salman, has been trying to get money from wealthy individuals within the country, using an approach that looks to outsiders like a shake-down. These things seem like very strange behaviors, suggesting that the country is experiencing serious financial difficulties. This is not surprising, given the low price of oil since 2014. On the oil-importer side, Greece seems to frequently need support from the EU. The lower oil prices since 2014 have somewhat helped the country, but the basic shape of the energy consumption per capita chart makes it look like it is struggling to avoid collapse. Figure 17. 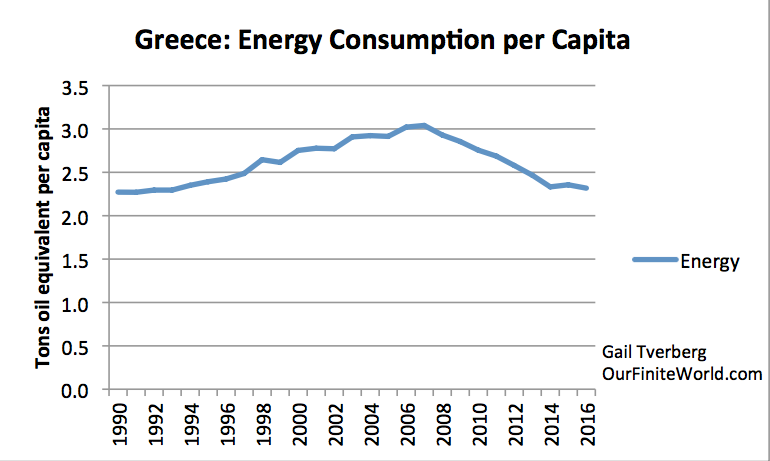 Greece energy per capita. Energy data from BP Statistical Review of World Energy, 2017; population estimates from UN 2017 Population data and Medium projections. There are many other countries struggling with falling energy consumption per capita. Figure 18 shows a chart with four such countries. Figure 18. 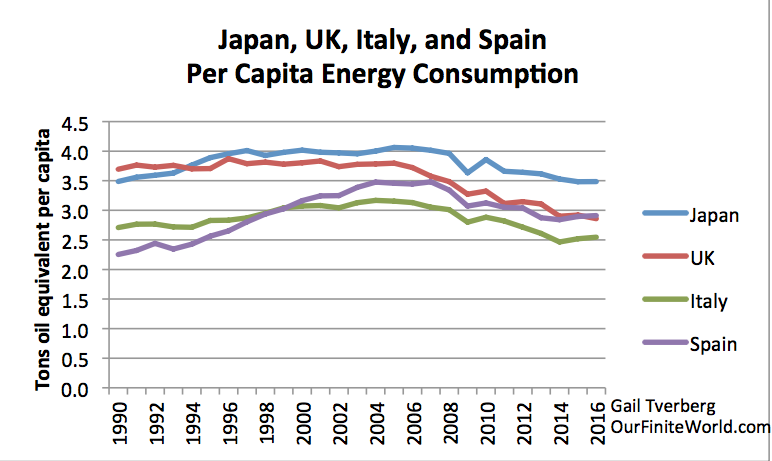 Energy consumption per capita for Japan, UK, Italy, and Spain. Energy consumption from BP Statistical Review of World Energy; population from UN 2017 Population data and Medium Estimates. In a sense, even though oil prices have been lower since 2014, prices haven’t been low enough to fix the economic problems these countries have been having. China is in a different kind of situation that could also lead to its collapse. It built its economy on coal production and rapidly growing debt. Now its coal production is down, and it is difficult for imports and substitution of other fuels to completely compensate. If slowing growth in fuel consumption slows economic growth, debt will become much harder to repay. Major debt defaults could theoretically lead to collapse. If China were to collapse, it would seriously affect the rest of the world because of its extensive trading relationships. Leaders of countries with increasing wage disparity and unhappy electorates can be expected to make decisions that will move away from globalization. Unhappy workers are likely to elect at least some leaders who recognize that globalization is at least a small part of their problems. This is what has happened in the US, with the election of President Trump. The hope, of course, is that even though the rest of the world is becoming poorer and poorer (essentially because of inadequate growth of cheap-to-produce energy supplies), somehow a particular economy can “wall itself off” from this problem. President Donald Trump is trying to remake trading arrangements, based on this view. The UK Brexit vote was in a sense similar. These are the kinds of actions that can be expected to scale back globalization. Having enough cheap energy for the world’s population has been a problem for a very long time. When there is enough cheap-to-produce energy to go around, the obvious choice is to co-operate. Thus the trend toward globalization makes sense. When there is not enough cheap-to-produce energy to go around, the obvious choice is to try reduce the effects of globalization and immigration. This is the major reason why globalization can’t last. We now have problems with both coal and oil. With the decline in China’s coal supplies, we are reaching the point where there are no longer enough cheap energy supplies to go around. At first glance, it looks like there is enough, or perhaps even a superabundance. The problem is that no price works. Producers around the world need higher oil prices, to be compensated for their total cost, including the cost of extraction, developing new fields, and the tax levels governments of exporting countries need. Consumers around the world are already having trouble trying to afford $70 per barrel oil. This is what leads to gluts. We have been told that adding wind and solar to the electric grid can solve our problems, but this solution is simply absurd. If the world is to go forward as before, it somehow needs a new very large, very cheap supply of energy, to offset our problems with both coal and oil. This new energy supply should not be polluting, either. At this point, it is hard to see any solution to the energy problems that we are facing. The best we can try to do is “kick the can” down the road a little farther. Perhaps “globalization light” is the way to go. This entry was posted in Financial Implications and tagged coal production, economic collapse, economic growth, oil prices, wage disparity. Bookmark the permalink. I worked in SF as a commercial RE agent back in the 80’s before moving the family to Jackson Hole. There were so many people on the streets asking for spare change. We had this building south of Market (SOMA) that needed cleaning and stuff thrown into a dumpster. Being young I suggested we hire the homeless. Hired 5 out of 11 off the street applicants. 3 worked one hour and wanted payment, then quit. 1 worked 2 hours and bailed out. Only one worked for 3 hours and the actual work done was not much. We came back the next day in our junky cloths and the two of us RE agents did all the work in one 10 hour day. The next day we went back to work in our suits getting to work at 7am. They use to hand out cans of food to the homeless. The homeless would take the cans and spread out in different directions selling the cans to get money for alcohol. My lesson: There’s a reason their homeless, or at least there was back then. Maybe the metrics have shifted – I don’t know if that’s true or not. Whenever I’ve needed work a fever comes over me and I find work by whatever means necessary. I think it has to do with motivation. You can’t force a person to become motivated. Yes, sadly true: drink and drugs, mental illness – often beyond help really. Lots of fake beggars here though – as it’s a rich town, they congregate in order to try it on. But it is a huge problem. Yes, guns are the issue. The reason is gun manufacturers, like all connected businesses, have unlimited credit to keep on making and selling deadly guns to the American public for profit. These are not self defense weapons, these are designed to kill and do so in large numbers. The gun problem is no different than the drug problem or anything else. But I guess dead kids doesn’t register to you “capitalism at all costs” doomers. Who cares about the next generation of human beings as long as Fast Eddy and his gang can hoard weapons and believe they will outlast the zombies in their bunkers, right? Prior generations also believed in weapons and war. They believed they were immortal and all powerful. Look at how it turned out for them. Someday, one of you is going to get shot. I won’t have sympathy for you on that day, because that is your idealogy, that is your belief. Yes, they are military weapons, like the AR15 which was used by US forces in Vietnam. My argument against weapons that can kill large numbers of people fast, is they don’t sell grenades do they? Fact is a person with an AR15 vs. a person with grenades would most likely be able to kill more people faster. But if you ask people why don’t they sell grenades to the general public people scoff at that very question. Isn’t that interesting. They won’t even entertain the question, yet an AR15 can kill more faster. Food for thought. How often does this self-defending with gun work? It is a hassle bringing a cell phone to the beach or gym, how about a gun? Assholes approaches you. Start verbally abusing you. Then push you. Then draws knife, and then gun. At what point are you supposed to pull your gun and shoot him? as soon as possible. aim carefully. A significant number of shootings are accidental and take place in the home. There is no verbal abuse. A loaded gun is left in an accessible place. A person, often a child, picks it up and shoots a family member or friend dead. Then sometimes the shooter takes his/her own life as well. A nice kettle of fish. That was what I was after. If it should be any use you have to have it with you, loaded, easily accessible. Unlikely being of help when jumped from behind in an alley, but likely leading to accidents and killing colorful people who was gonna ask about directions to nearest KFC. Duh….jumped from behind in an alley? The entire concept of self defense is self awareness….being aware of possible assaults and avoiding them. No sensible, self aware person gets jumped from behind in an alley. What were you doing in that alley anyway? Buying drugs? Responsible gun ownership reduces crime. The US looks to be nightmarish. Thankfully, in England guns are very strictly controlled, and the criminals (foreign and the semi-human layer of society) mostly blow one another away in their awful suburbs – for now. Having had a lot of trouble with the local thug, death threats, etc, I unexpectedly turned up behind him one night while he was walking his dog, with a heavy ‘walking stick’ in my hand. In a village, you get to know everyone’s habits, so planning is easy enough. Not a word was said. He got the message, I think, as to what could conceivably happen at any time, and has been as quiet as a lamb since….. In the peaceful UK you just have to worry about being knifed to death, like what happened to my son in law, and what did happen to a man complaining about noise in front of his house to drunks, who killed him, while I was in the UK once. UK under-reports their homicide statistics compared to the US methodology. US lists homicides at the time of the crime – UK at the time of conviction. Depending on your source, it seems like more than half of homicides go unsolved – so food for thought when thinking about these risks. ..you just admitted that all jaw abiding people in the UK can’t have guns, but the criminals do have them. In the UK an AR-15 sells for around 35k dollars on the black market..And if you have 35k to blow on a gun you don’t need to be a criminal…. why were you getting death threats? Legally obtaining a shotgun in the UK is fairly easy. In the absence of a criminal record or a medical history of mental problems, applications for a shotgun certificate are rarely refused. Getting a firearm is more difficult. The police want to see the applicant has a good reason for wanting a firearm, e.g. being a member of a gun club for at least six months or eradication of vermin on a farm, before granting a firearm license. Can you walk around on town with your guns? Keep them in the glove department? In the (unlocked) shed? it’s part of the beauty of this place—unpleasant in some quarters i agree, but in general our police just offer friendly advice, they dont shoot first. Nope. Guns cannot be carried around in public without a legitimate reason and must be stored in a locked cabinet when not in use. The logic in the courts often goes that tools (weapons) used by police in the ordinary course of protecting their lives are legitimate means for citizens to defend themselves. A grenade cannot be targeted with any degree of responsibility, given that both citizens and law enforcement are responsible legally for collateral damage of both life and property. People do entertain these questions quite seriously. Look at how it worked out? It worked out that people with strength of arms and weapons dominated those who had none, until the latter used violence or the threat of violence to enforce their interests. When the real end hits… there will be only darkness afterwards…. Either put these wander-losers on a fossil fuel diet, or make them go cold turkey. Its just the human condition; everybody wants a freebie. Speaking of which I heard the EU has decided against free trade with the US unless they re-join the Paris Accord. But we don’t learn anything about the financial condition of the federal government, from neither the Wall Street Journal nor the New York Times. The largest financial institution in world history issued its annual report yesterday, and nobody cares. Nicely written. Entitlements are the largest issue and I am one of the entitlees; SS and Medicare really are wonderful in terms of value received. Even at the high end, Medicare is somewhere between $400 and $800 per month less that private insurance and this includes all the supplemental policies, etc. The government does a nice job of controlling prices here compared to what is charged. Going forward, I expect my benefits to be cut which means when and not if the life ending disease strikes, treatment will be deferred until no longer necessary; this can be expected with the rise of the millennials in to voting ranks. Or, the deficit will go down and I along with it. It is still a beautiful world FE, I am hoping and assuming your home was spared the worst of the bad weather. Doomsteads really are a waste of money and time, aren’t they? We look forward to hearing about your replacement home and lifestyle. You are knowledgeable and entertaining. I saw this article. I earlier saw an article about how the US government was changing its accounting, so as to treat some expenditures as “investments” rather than simply outflow. I suppose that there is also the issue of regarding all of the student loans the government is giving. I am sure that the government is assuming that this will be paid back, with interest. I will have to take a look at the report. A person wonders how much debt really needs to be added.